We love wine. And we love to be pampered. So as you can imagine, the emerging concept of “vinotherapy” wine spa experiences has truly had us reaching for our fluffy robes and racing full pelt to the vineyards! So what is this heavenly wine spa combo really all about? According to wellness experts, grape pulp is a fantastic exfoliator and an anti-ageing agent to boot! Are we the only ones to wonder how on earth this was actually discovered though? The image in our minds of a wrinkled French wine-maker rolling around in his grapes and marvelling at his silky soft skin just seems a little outlandish, so we decided to find out what really happened! So, it all started in one of the most famous wine regions in the world: Bordeaux. Wine-makers Mathilde and Bertrand Thomas (see? We weren’t that far out!) discovered the “exceptional powers” that grapes possess in the early 90’s and two years later, they registered the patent for “extracting and stabilising grape-seed Polyphenols” and established the Caudalie brand. 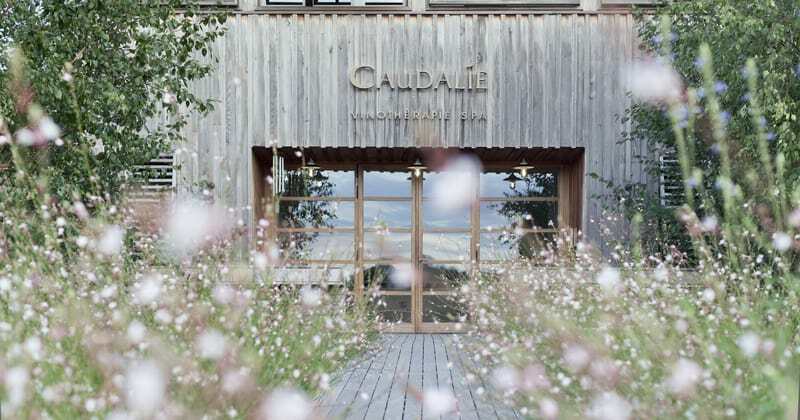 The Caudalie skincare and beauty brand is now a global company, with ten wine spa centres across the globe. The first spa, les Sources de Caudalie, opened in 1999 is one of our favourites. Located in the stunning Graves vineyards, we have created a selection of fantastic indulging breaks for Grape Escapes guests. Typical packages include two nights at the 5* hotel, a spa morning with vinotherapy treatments, and an afternoon visiting the region’s top wine Châteaux such as the Grand Cru Classé Pape-Clement in nearby Pessac-Leognan. This is our favourite Château in the Graves appellation, and we adore the gourmet picnic served in the stunning grounds. 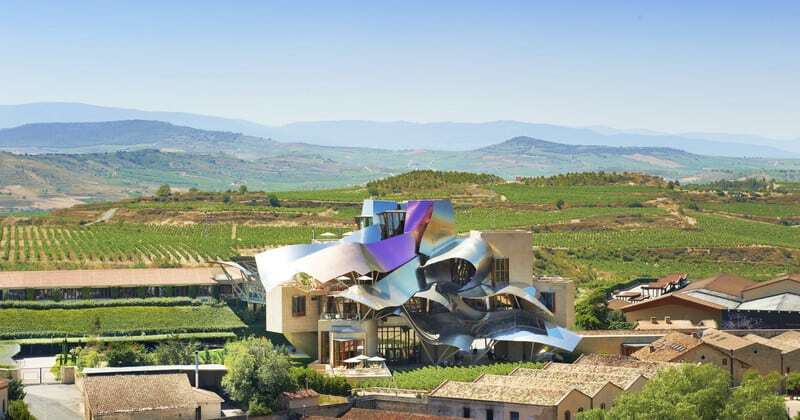 And if combining wine and wellness wasn’t already an irresistible concept, the Rioja region went and topped it by adding astonishing architecture into the mix! Marqués de Riscal is one of the most prestigious wine producers in the region and is particularly famed for its pioneering and innovative practices, so it made perfect sense to enlist the eccentric architect Frank Gehry to design a luxury 5* spa hotel. His creation is unmissable. Appearing like a mirage amidst the gently sloping vineyards, ribbons of curved steel and titanium shimmer and reflect the hills, sky and the vineyards’ thousand colours throughout the changing seasons. The full range of Caudalie spa treatments is available here, and by far our favourite treatment is the exfoliating bubbly bath in a traditional wine barrel. With enough space for two people, this unique experience is a true romantic treat, although we are not sure that Oz Clark and James May will agree with us (if you haven’t already seen it, check out Oz and James’s Big Wine Adventure for their special moment together at Caudalie in Bordeaux)! Our luxurious three and four day breaks at Marqués de Riscal start at just £510 per person including a full day VIP wine tour. See here for full details.